I love nothing more than a good summer movie and Sarah's Key looks to be a great one. The trailer (which you can watch below) is really moving. I think this will be a powerful film. I know the book Sarah's Key is dearly loved by a lot of people so I'm sure that many of you are looking forward to this film. But, if you haven't heard of it yet or had a chance to read the book, have I got a giveaway for you! 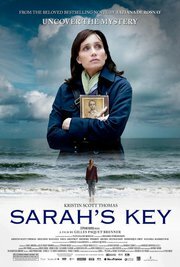 Sarah's Key the film opens in theaters July 22nd. To celebrate the release of the film, The Weinstein Company is giving one copy of the book, Sarah's Key, and a movie poster to one lucky winner! You can keep up to date on all things going on with Sarah's Key by following The Weinstein Company on Twitter, liking their Facebook page, and visiting the Sarah's Key website. One copy of the book and one movie poster will be given to one winner chosen at random. The winner will be emailed. US residents only. This Giveaway closes July 16th at 11:59 EST.